Lee (vocals and guitar) has spent the last 7 years playing professionally around Europe from the prestigious Hard Rock Café to backing some great artists from bands such as Iron Maiden, The Mersey Beats and Irelands, Aslan. Don (vocals and guitar) has 25 years playing experience in numerous bands from cover acts to original artists. 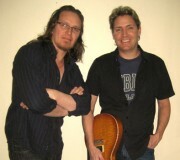 They have 45 yrs combined experience in entertaining a crowd and there set covers everything from classic rock to modern pop and excel in getting a crowd involved and motivated. A true passion for playing live comes across from this duo and it is a cut above the standard duo playing around Melbourne, if you are a music lover then this is the duo to have, book today!